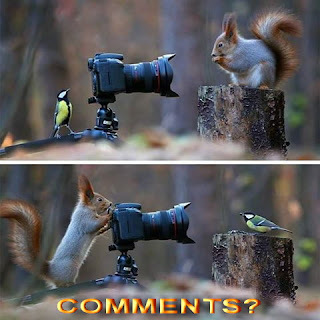 Welcome to some facts about an animal I'd like to observe and photograph. The grizzly bear is a sub-species of the brown bear, also known as the Silvertip Bear. The grizzly bears live in the uplands of western North America, and each female bear produces a litter of young roughly every other year. Grizzly bears can often be seen to congregate together around streams in the salmon season to get the best catch. The grizzly bear is generally a solitary mammal. It is estimated that less than 10% of grizzly bears make it into full adulthood. While the grizzly bear has no natural predators, the bears have been hunted by humans almost to extinction. The grizzly bear has a bad reputation amongst humans and animals alike, as the grizzly bear is known to be aggressive and very territorial. 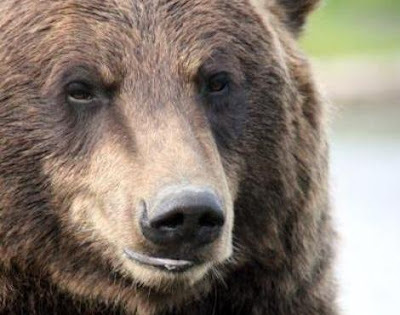 Due to the grizzly bears size, there are no known North American mammals that would naturally prey on the grizzly bear, making the grizzly bear an extremely dominant predator. Female grizzly bears that have grizzly bear cubs will often be extremely wary of other animals and the grizzly bear mother will often keep her grizzly bear cubs in quieter areas until the grizzly bear cubs are old enough and big enough to defend themselves, at which point the grizzly bear cubs will generally venture away from their grizzly bear mother in order to begin a life of roaming themselves. 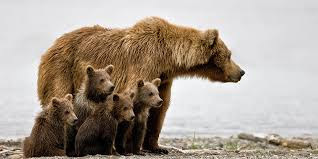 The grizzly bear mothers however are incredibly protective of their young and will generally always attack any animal that she believes is a danger to her young family. Male grizzly bears can grow to a height of more than 3 meters tall when standing on their hind legs, with female grizzly bears being around 40% smaller. As with the brown bear (from which the grizzly bear is thought to have come from), the grizzly bear has a humped look at the top of the grizzly bears back, which is the build of the enormous muscle that provides the bears with the strength they need, mainly when digging. 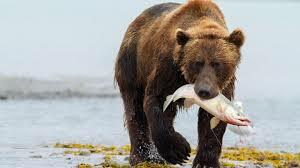 Although it is generally believed that the grizzly bear is a carnivore, grizzly bears, as with most other bear species, are in fact omnivores as the grizzly bear diet consists of both plants and animals. 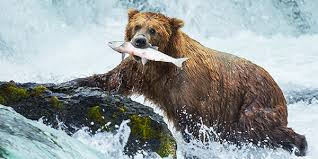 The grizzly bear is most famously known for its love of salmon and can often be seen in large groups around the areas where the salmon spawn. 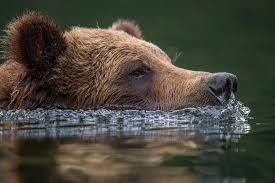 The grizzly bears are still very territorial though but appear to stay out of each others way on these occasions as there is always plenty of fish to go round. Clancy's comment: Yep, I would love to observe them up close and personal.